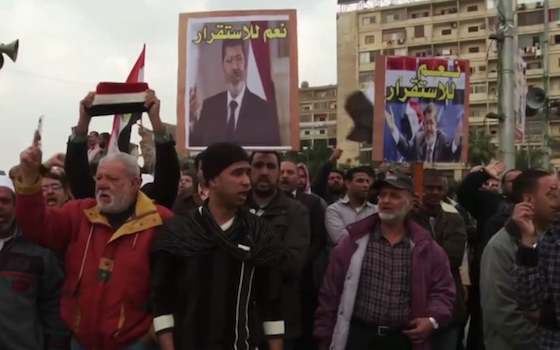 Supporters of the Muslim Brotherhood claim that it was leading a revolutionary attack on Egypt's authoritarian regime when it was stopped in its tracks over the summer by a counter-revolution. This is fiction. The Brotherhood's ambition was simply to replace the old ruling party at the pinnacle of power. The 2011 uprising had redistributed power within the country's ruling 'power triangle', the uneasy partnership between military, security, and political institutions. The security sector had lost its overriding dominance of the ruling bloc, and was now forced to play second fiddle to the once marginalized military. The political slot was open for negotiations, and the Brotherhood wanted to present itself as the best candidate by appeasing the two custodians of violence. The Brotherhood never hinted at challenging the autonomy and privileges of the armed forces (economic or otherwise), and made sure it stayed on the right side of the military leadership all along. Thanks to the Brotherhood's unconditional support, Egypt's security establishment was not so much as dented during the 2011 revolt. While demonstrators were making their stand against Mubarak in Tahrir Square, Mohamed Morsi, the future President, and Saad al-Katatni, head of the Brotherhood's Freedom and Justice Party, negotiated secretly with Omar Suleiman, Egypt's intelligence chief, for a larger share of the political pie in return for aborting the uprising. Immediately after Mubarak's ousting, the Brothers entrenched themselves with the security apparatus to impose their preferred road map: elections first, and the constitution and reform later. Pleas to at least overhaul security agencies before proceeding to elections were rejected. The Brothers then shamelessly encouraged repression throughout the transitional period, blaming the victims on each occasion for taking the law into their own hands, and repeating allegations that revolutionary activists were either hired guns or the unwitting pawns of devious foreign plots to destabilize Egypt. In parliament, they spared no opportunity to praise Egypt's gallant law enforcers. And when Morsi was elected President, he announced that the Interior Ministry had been rehabilitated and was performing the most patriotic of duties. The president not only dropped a fact-finding commission report detailing abuses, including the shooting of demonstrators, but audaciously congratulated police for their valuable contribution to the 2011 uprising. Needless to say, security abuses increased substantially in his short tenure, and soon enough official coercion was augmented with Brotherhood militias. This hardly came as a surprise from an organization obsessed with foiling secular conspiracies and policing social piety. But the Brotherhood had moral and practical justifications for sacrificing revolutionaries at the altar. Morally, they felt entitled to rule after eight-and-a-half decades of political toiling. Most of the movement's leaders saw their best years wasted behind prison bars. Moreover, as the true representatives of Islam, the Brothers believed they were obliged to safeguard the faithful from secularists. On a practical level, the Brotherhood appreciated the difficulty of confronting the security forces. Although uniting the revolutionary camp under its banner would have offered it a fighting chance, the Brotherhood did not have the stomach for that. As it turned out, deferring to the military and security was not enough to consolidate power. The army, in particular, needed to relieve itself of the burden of domestic rule to focus on some of the more pressing geopolitical issues: rebuilding its capacity as a combat force, diversifying its weapon sources beyond the US, reversing the demilitarization of Sinai and pursuing means of projecting regional power. The Brotherhood was thus expected to stabilize the political arena, but they failed to deliver because of their ineptitude at political bargaining. It was clear that none of the three political contenders (Islamists, old regime loyalists, and civil activists) was strong enough to rule alone. Alliances were necessary. Instead of siding with either old regime or revolutionary forces, the Brothers tried to play them off against each other to buy time. Old regime politicians suspected that despite their sugar-coated promises, the Brothers were not willing to share the spoils of Egypt's patronage state. And civil activists resented the Brotherhood's hijacking of their revolt. Unfortunately, the Islamists failed to appreciate that their intransigence would drive their political rivals into a tactical alliance against them, and that such an alliance was bound to force officers to revise their stance. That being said, the Brotherhood's opponents could not have fielded enough protesters to secure the cooperation of the high command had the common folk abstained. It was the Brotherhood's shocking incompetence at government that drove millions into the streets on June 30. And it was the Brotherhood's decision to turn a political clash into a religious war that guaranteed the public's blanket endorsement for brutally repressing them. The Brothers were ousted not because of their political duplicity, but because they were so bad at it. And they were later hunted down because they never understood that their countrymen preferred to risk backtracking into a functioning secular authoritarianism to the certainty of sliding into incompetent religious fascism. "Egypt: How the Brotherhood Failed"